Last week, we looked at some reasons why even the most rational individual might feel a touch of dread at the thought of a car that drives itself. This week, let’s zoom out a bit, and imagine a future society where driverless cars are the norm. I think this is a very plausible scenario, but I must say, some of the implications are downright weird. Here are 5 odd things about a driverless future that I haven’t seen explored anywhere else. 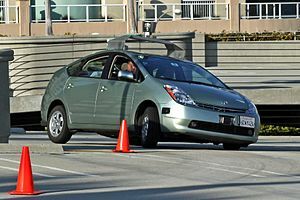 Driverless cars will be designed (I hope) to be really good at not hitting people. This behavior, however, can easily be exploited by unscrupulous pedestrians. Once you develop a good sense for robot drivers’ abilities, you can cross 5th Avenue to get a bagel without even looking. No reason to wait for the light when you can stroll across at your leisure, knowing all the cars will swerve harmlessly around you or slam on the brakes. Sure, it’s rude, but there’s plenty of traffic-inspired rudeness around today, and I see no reason that would change. Want to go 75 on a 65 mph highway? Feel like squeezing through that intersection on a yellow light? Well, too bad, because I’m pretty sure robot cars will be programmed for strict legality. Cars might download speed limit information from a cloud database, as GPS devices do today. Or maybe we’d need to set up stationary devices to send instructions to nearby vehicles, for example to set a temporary speed limit at a construction zone, or to forbid right turns at a particular red light. Either way, a given community’s traffic rules may as well be ironclad laws of nature as far as your car is concerned. Remember, anything that can be programmed can also be reprogrammed. I expect that driverless cars ultimately won’t have a huge number of security holes. But as I mention above, cars may find it useful to connect to the internet or external devices to get maps, traffic information and more. These are potential access points through which a shady individual could compromise your car’s controls. On a related note, exposure to a malicious virus could shut down your car – or worse – at an inopportune moment. Some driving decisions can’t be automated because they’re subjective. For example, in heavy traffic, I often choose to let someone turn in front of me, so that they don’t end up waiting all day. But just how generous would a robot driver be? Would it stop to let that poor pedestrian cross the street? Could it ever pass up a prime parking space and offer it to a pregnant woman instead? Perhaps cars will one day come with a variable “niceness” setting – that’d be cool. Or maybe different models of car would come with different driving personalities. Imagine how a Porsche 911 would tend to behave, compared with a Chrysler minivan. Today, and presumably tomorrow, plenty of humans enjoy driving, not because it’s a practical way to get somewhere but for the sheer fun of it. Still, I can imagine human drivers being banned from the roads, given how relatively unsafe they are. If this comes to pass, perhaps we could designate recreational areas for manual driving, a place where people could still feel the satisfaction of gears shifting at their touch and an engine responding to their will. Human-drivable cars, in such a scenario, would be a sort of luxury specialty item, for those with the money to buy one and the desire to drive it themselves. So those are 5 reasons I think a driverless future is going to be weird. Now it’s your turn – do you think any of these will come to pass? Did I miss any neat implications? And what do you think of a world with no drivers? Tags: artificial intelligence, cars, hacking, security, transportation. Bookmark the permalink. Probably not much, except for looking out the windows. Although that actually sounds kind of nice, having a set time in the day that can’t be filled with words or screens! I especially like number 5. If that comes to be, I want my speciality car to be a Porshe with a stick shift and a leather (oh, no, not leather!) steering wheel. Red would be cool. Sounds perfect! I’ll take one, too. I love #4 since I am frequently delighted to see just how generous drivers can be, wherever I go. Of course there are always a few selfish megalomaniacs. Still, people can be mighty nice to each other. I hope the computer programming will accommodate that generosity of spirit. Regarding no more speeding, then there will be no more speeding tickets. Some municipalities will lose money! True, tickets are often a revenue stream. Although I must say as a driver, if I could program my car to avoid all parking tickets forever, I’d do that too! Perhaps a toll or car tax could make up the difference. Some interesting points made here. I hadn’t thought of the total lack of speeding. There are some times when you need to make a quick getaway, like in cases of natural disasters or health emergencies. And until most of the cars on the road are self-driving, I bet insurance companies are going to have a field day dealing with roads half-filled with autonomous cars. Yikes, I wouldn’t want my car to amble through a school zone when I need to get to the hospital! I’m imagining a “911” button or some kind of emergency override, but I’m not sure exactly how it would work. And you’re also right that the insurance industry is going to have an unusual situation on its hands for quite a while, I’m very interested to see how they deal with it. Thanks for your thoughts!